Yep, and it feels good!!! I couldn’t stand it anymore. I had sooo many ideas in my head, I thought I would explode. So here’s a sneak peek at a sample of ONE of the classes in February. It’s a step-up from the Texture Paste class last year, so if you’re feeling more adventurous, keep an eye out for the updated class list in the side bar. 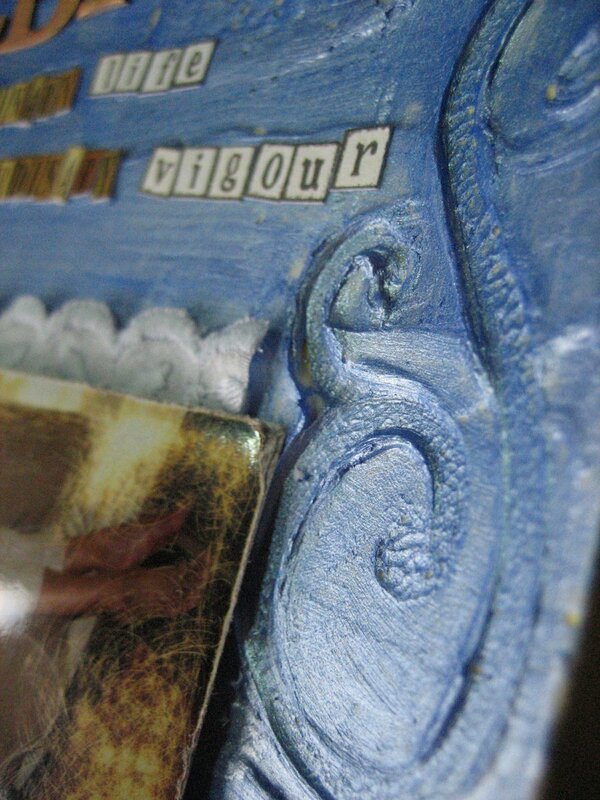 It’s collage-inspired, but you know I’ll never go completely nuts with the collagey stuff (heehee). Lots of to-ing and fro-ing with the boys and play-dates because it’s back to school next week!! Can I be more excited??? Still waiting on word from Rainer’s speechy (grrr, hate waiting! ), Michael’s already doing more short trips, ordered some cool crafty and ASD books from Amazon for the first time (that was a little freaky) and had a wonderful time at Inkredible’s VIP night last Friday. The “poofy” shirt has not been altered yet (thanks for asking Tamara LOL!!). I have to resurrect my sewing machine from the nether-regions so hopefully soon. Went to Molly’s baby shower yesterday which was a fantastic extended break from the kids. Naturally Kelly couldn’t help herself and we had 3 games. Normally I don’t like these kinds of events where you play insipid, gender-defining, clap-trap, but the competitive streak in me just burst forth!! The first game was “Who’s Your Daddy?” and I’m sure you had to be a trashy-mag-junkie b/c I had NO idea who these celeb kids’ dads are!! The next was more up my alley! 20 songs with BABY in their title. One point for artist and another for title. Did I kick proverbial ARSE or what??!!! 26/40 – way too much time clubbing in the 80s and 90s. Just for fun….here’s one that NO-ONE BUT ME got correct!! Ah, I miss Countdown!! and nice to see skinny jeans back in fashion…..NOT!!! Some 1979 goodness!! BRIGHTER AND BUOYANT IN ’08!!! Loving the look of that layout Giovanna – can’t wait to see it IRL.